Thread: Guppy and Shrimps after 3 months - success! Started off aquarium hobby at the end of the June school holidays with some gold fish. Now after 3 months, allow me to show success in 2 planted tanks - 40cm shrimp and 60cm guppy. Started off mixing shrimp with guppies. First batch of baby shrimps coincided with birth of guppy fry. These nosey fry were in every corner of the 60cm tank. 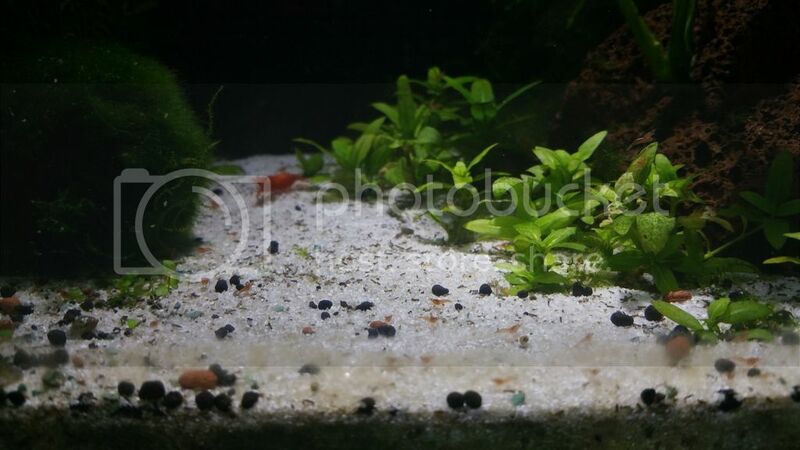 Even though it was quite heavily planted and with rocks and a big drift wood them pesky fries were nibbling at the baby shrimp and killing them. Only about 3 survived. So I separated them. - Ludwidia growing fast and stem propagated. All without CO2 or fertilizer. - Sinking the huge driftwood after about 2 mths. With help of stones. - First batch of baby shrimps eaten. - Gravel in 60cm. Sand in 40cm. - Good light and nutrient rich substrate from food/waste is enough - no need CO2 or fertilizer. 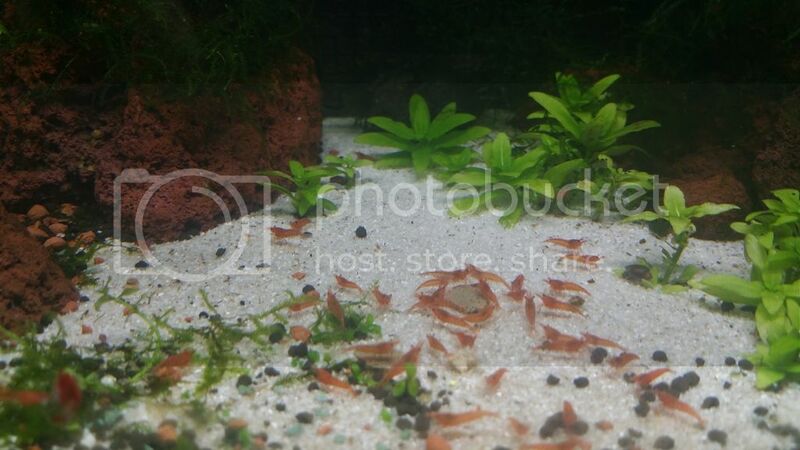 - Breeding shrimp n guppies is not difficult. 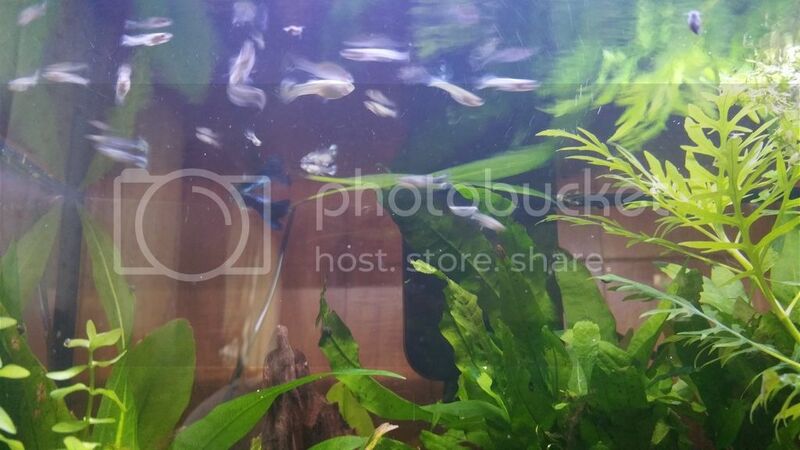 NOTE: AM ON LOOKOUT FOR NICE MOSCOW BLUE/GREEN GUPPIES...LET ME KNOW IF YOU HAVE OR KNOW SOMEONE WHO HAS THEM. Re: Guppy and Shrimps after 3 months - success! May I know what plants are on the right side of the first pic? Thanks! Great job btw! I intend on putting cherry shrimps in my tank, thought guppies would eat them up like my previous tank.. The plants are Staurogyne Repens or S. Repens for short. Guppies would definitely eat the baby shrimp especially the guppy fry, juveniles and female adults. I find male adult guppies rather mild and leave the shrimp more or less alone. When you hear people say a heavily planted tank will provide hiding for the baby shrimp, they mean a really heavily planted tank, heavier than mine with plants reaching to almost the water line as baby shrimp will swim all over. As I have only 2 tanks, what I am doing is keeping the fire reds in the shrimp tank to breed red ones, and put the Sakuras and lighter ones in the guppy tank, so if some get eaten its the less red ones that get eaten. And the guppy tank plants are getting denser as time goes by so higher chances of baby shrimp surviving. Happy to update 2nd shrimp birth. Can you see the even smaller shrimp?hee hee had to wait a week before they had some colour to be noticea le. Also my el cheapo china made led spot light failed from obvious lousy wiring design. Got the super bright Aqualighter 1. Wow...that looks great! Your shrimp farm is up and running.